‘Tis the season of gift giving! As you all know, we have just released a whole new collection, just in time for the holidays. If you need a little help with what to get for your loved ones this season, you won’t want to skip this guide. It can help you pick out not only pieces from our company, but clothing from other companies as well. Don’t wait too long to pick these out, so you can get them right on time for your Holiday occasion! Our “Turquoise Leather Choker” paired with a beautiful cocktail dress from Melodrama Boutique. Our Turquoise Leather Choker is paired with this beautiful outfit (top and trousers) from A Leap of Style. If you know someone that loves jewelry, but can be a little shy about wearing such bold pieces, go for our Turquoise Leather Choker. This piece could be perfectly paired with the outfit shown right, as styled by Melodrama Boutique. from A Leap of Style. This choker also comes in Denim, which would also be great with this top. We also have brand new bangles that are great for a pop of color with a simple outfit. As well as button or dangle earrings that embody E. Turner Couture perfectly, even for the shyest person. 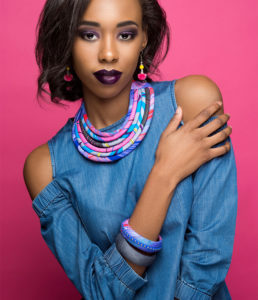 Our “Vibrant Neon Pink Beaded Ankara Bib Necklace” paired with a cobalt blue top from Melodrama Boutique. Our Ankara/Leather/Gold Quartz necklace was paired perfectly with this beautiful peach jumpsuit from Melodrama Boutique. If you know someone that really goes outside of the norm with their fashion, we have so many pieces for them. For example, our Vibrant Neon Pink Beaded Ankara Bib Necklace is the perfect piece if the person you love can absolutely rock vibrant colors. This bib necklace is best paired with darker colors, like we have on our model. It really helps the colors on the necklace to shine. We also have bigger pieces like Long Ankara/Kente Necklace or the Ankara, Leather & Gold Quartz Statement Necklace, that can really be showstoppers. 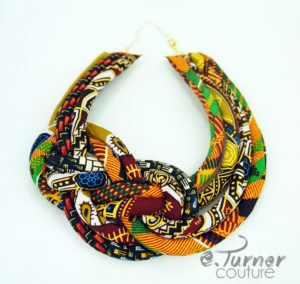 This Kente Sailor’s Knot Necklace is a great statement piece. Our Multi-strand Ankara/Kente Choker is paired great with this collared button-up dress. Some other great options are our Multi-Strand Ankara/Kente Choker, and the Kente Sailor’s Knot Necklace. These pieces have been best sellers amongst our customers, so we know they’ll be great gifts for this season. Our Long Ankara/Kente Necklace paired with a sweater dress from Melodrama Boutique. Our Vibrant Ankara Bib necklace is paired with this open shoulder denim top from Melodrama Boutique. Our collection was made with those metal allergies in mind. We have several necklaces that tie in the back, rather than clip with chains. 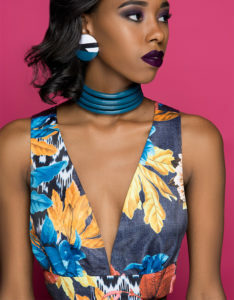 Our Long Ankara/Kente Necklace and Vibrant Ankara Bib Necklace contain absolutely no metal and are just as exciting and beautiful as the ones with. Our new line of bangles also don’t use metal, so your loved one can enjoy with ease. Mimi aka OfficialCorporateChic styles our scarf with this amazing outfit. The Brown Kente Ruffle Scarf is back, just in time for the Holidays. previously modeled by Mimi aka @OfficialCorporateChic. This scarf was originally in a different pattern, but we brought it back this season in a brown kente fabric. Our small and large bangles styled with a beautiful cocktail dress from Melodrama Boutique. 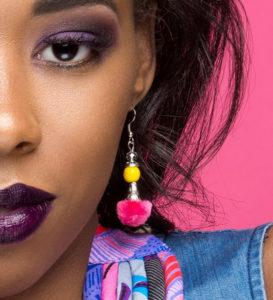 Our Pink Pom-Pom Dangle Earrings look awesome with this denim top from Melodrama Boutique, and our Vibrant Ankara Bib Necklace. Stocking stuffers can be tricky to shop for, but we got you covered. Our new bangles and earrings are the perfect sizes to put in a stocking. We have 15 different styles of the large bangles (including denim!) and eight different styles of the small bangles. Our earrings also range in style. We have large button earrings (like our Teal/White Large Button Earrings), as well as beaded dangle earrings. The earrings can be easily paired with one of our necklaces from our Holiday Collection. For our photoshoot for this collection, we picked the earrings we thought looked best with each necklace. Feel free to use that as a guide! Of course, if all of this is overwhelming for you, we do offer gift cards. You can’t go wrong with those. Happy shopping! This entry was posted in Gifts & Occasions and tagged african gift guide, african gifts, artistic, artistic people, artsy, artsy gifts, artsy people, creative gifts, creative people, statement jewelry, unique african gifts, unique gifts.